The media is currently abuzz with new daily updates about the Royal Wedding between Prince Harry and Megan Markle on Saturday 19th May. According to reports, Megan has spent an eye watering £400,000 on her wedding dress for the occasion, with lots of speculation over which designer will design the dress. Whoever planned the date clearly didn’t check what other events were happening on the day, as the 19th May is also FA Cup Final day. Fear not though, as depending on which team hoists the cup, it could be a day for double celebrations and the perfect excuse for a Royal Wedding party. What better way to spend the day than celebrating with a party! Invite your friends and family round for a party feast and spread the celebrations throughout the day to cover the Wedding and FA Cup Final. 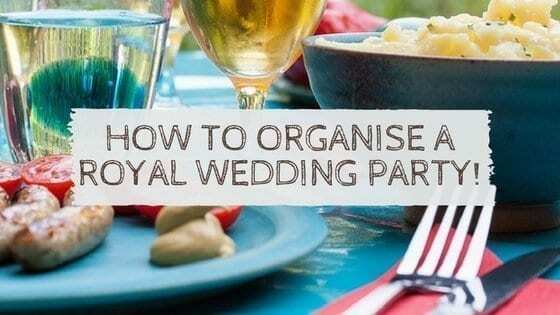 There are lots of fun party invite ideas and other royal wedding party crafts on Pinterest to get your guests truly in the party spirit. It may not be an invite to the actual wedding, but it will be an invite to a fabulous party to celebrate! If you are unable to have a street party, then have a garden party instead! Covering any eventuality with the weather, it’s best to have a gazebo just in case. Make sure you mow your lawn as close to the event as possible, or if you are already considering having fake grass laid down, this is the prime opportunity! Easy to maintain and clear up after the event and the greatest excuse to have more garden parties in future! String fairy lights around your garden for when the night starts drawing in, adding colour during the day and the night. Whether you are having a BBQ or a buffet, make sure you stock up on food and drink to mark the special day in style! By that time BBQ food should be in an abundance in the shops and stores such as Aldi always have a great selection at a very reasonable price. Cakes are always a winner at garden parties and if you are looking for a traditional cake,or even a Keto blueberry cake, all are always well received. Ooo a royal wedding party sounds like a wonderful idea. I’m always up for a celebration! I love it – I loved it when people did street parties for the Jubilee too. Nothing beats a good old celebration. I love this idea and everyone deserves to be treat like a royal at party time! I’m loving the idea of having a Royal Wedding Party at home! What a great way to join in with the nationwide celebrations. It’s such a great idea to have a big street party or garden party. Definitely a fun way to celebrate the day! It’s also the day of my baby shower – so inconsiderate of them all haha! Honestly I think the idea of spending £400k on a wedding dress is disgusting when there are so many people living below the poverty line in this country – I’d have expected better from these two! I didn’t know the FA Cup was on the same day! Definitely a double celebration for some people in the uk! You’ve inspired me! I think I definitely need to host a party! Although I have to say £400,000 for the dress is bloomin’ ridiculous! We had a royal wedding party for William and Kate’s wedding – it was such fun, loads of friends and their children. I still have all the bunting and union flags in the attic ready for the next one!